"For Double Outswinging Interior or Perimeter Doors - 1500 lbs. Holding Force"
- Select Finish: Brushed Anodized Aluminum (28) or Brushed Anodized Dark Bronze (40). - Delivery: The RCI 8320-IQ IntelliMag is factory-ordered, please allow 3-5 working days' lead time. The Intellimag® is the ideal solution for loss prevention from inside sources. This double intelligent magnet recognizes its own armature plate, preventing anyone from "tricking" the magnet with a separate plate! Each individually encoded armature plate is registered to match its own electromagnetic lock. Two independent relay outputs allow for lock status and alarm status for local and/or remote indication. The IQ series features a built-in time delay for instant release with adjustable relock. Applications: Interior or Perimeter. Pairs of outswinging doors without mullion. Pairs of inswinging doors without mullion (use with TJ (Z) brackets). Used for Office Complexes, Government Facilities, Warehouses, Retail, Commercial, Industrial & Health Care. - Illegal armature plate alarm. - LSS - Lock Status Sensor (includes LED). - Field-selectable voltage - 12/24VDC. - Adjustable relock time delay. - Available in Brushed Anodized Aluminum (28) & Brushed Anodized Dark Bronze (40) finish. - Easy access wiring cavity. - Encapsulated 8-bolt 'Drop-Stop' mounting. 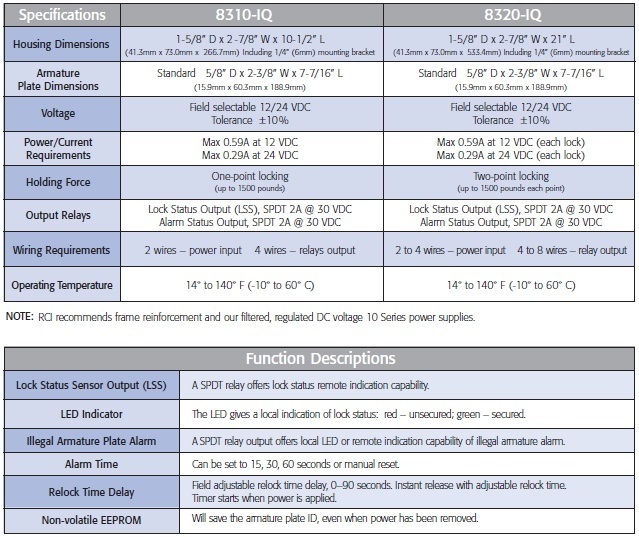 Lock Status Sensor Output (LSS): A SPDT relay offers lock status remote indication capability. LED Indicator: The LED gives a local indication of lock status: red - unsecured; green - secured. Illegal Armature Plate Alarm: A SPDT relay output offers local LED or remote indication capability of illegal armature alarm. Alarm Time: Can be set to 15, 30, 60 seconds or manual reset. Relock Time Delay: Field adjustable relock time delay, 0-90 seconds. Instant release with adjustable relock time. Timer starts when power is applied. Non-volatile EEPROM: Will save the armature plate ID, even when power has been removed.